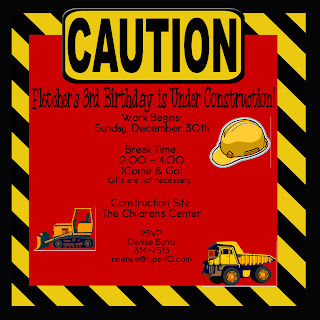 My niece Amber, (you know, party planner extraordinaire) put this e-invite together for Fletcher's 3rd birthday. Isn't it the cutest? That Amber she's the best! I do wish I knew how to make it bigger so you can see it better. Oh well, you get the idea! This has to be THE C-U-T-E-S-T invitation I have EVER seen!!!!! ADORABLE!!!! I wanted so badly to ask if you mind if I come by, but we will be out of town!!! Shoot! Well, I hope you all have a fantastic time and Fletcher loves every second of being celebrated! I am SO HAPPY that ya'll had such a great Christmas. I can see how much fun ya'll have together by the Guitar Hero picture! I LOVE this invitation. I think it's the cutest little kid one I've ever seen. Mind if I borrow the idea? You should frame a copy and hang it on the wall in Fletcher's room---maybe one at the center and one at home? LOVE IT!! It's times like these that I wish we lived closer! Give Bubba birthday hugs and kisses from all of us!! HAPPY BIRTHDAY SWEET BOY!! !